A Transient Ischemic Attack abbreviated as TIA, is similar to a stroke, because it produces the same symptoms as that of a stroke. But unlike a stroke, it only lasts for a few minutes and does not cause any permanent damage. It is often referred to as a ministroke; the transient ischemic attack can be a clear warning of an imminent stroke. About 1 in every 3 people who suffer from transient ischemic attack, eventually suffer from a stroke, half of this population suffer from a stroke within a year of suffering from TIA. Consider the transient ischemic attack as an opportunity and a clear warning, the chances of you suffering from a stroke are very high if you do not take the necessary actions to prevent it from happening. It can produce weakness, numbness in some parts of the body or paralysis of different body parts like face, arm and leg. In most patients it has been observed that the paralysis was caused only on one side of the body. It affects the speech adversely. The affects are so severe that people might have difficulty understanding the patient when he speaks. Most of the people who suffer from TIA, also suffer from afflictions concerning the eyes. It can cause blindness in either one of the eyes or both, it can also lead to double vision. Mostly people also tend to suffer from dizziness, vertigo along with failure to balance themselves and coordinate their muscle movements. A TIA and ischemic stroke share the same origins. 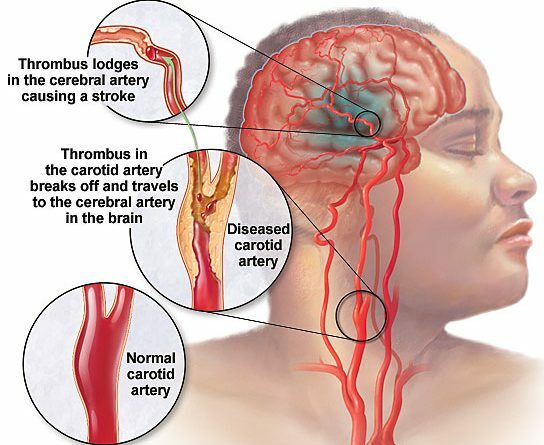 When a person suffers from ischemic stroke it is due to a clot that prevents the supply of blood to a part of your brain. In a TIA, unlike the ischemic stroke, this clot lasts for a very small duration and no permanent damage what so ever is caused. But to be more precise, TIA is most often caused by an excess of cholesterol-rich fatty deposits, which are also known as plaques, building in any artery or a branch of artery that is responsible for sending the blood and other necessary supplies to the brain. These deposits or build ups can eventually cause a decrease in the blood flow moving through the artery or lead to the formation of a clot. A blood clot located in the artery which is used to supply the brain with blood and nutrients from another organ of your body, mostly the heart, may also cause TIA. There are some risk factors for the TIA that you just cannot control or change. While there are others that you can easily control. The Family history: You are at a huge risk of suffering from a TIA if one or more of your family members have suffered from either a TIA or a stroke. The age factor: as you get older, especially after you cross 55, the risk of you suffering from TIA increases incredibly. The gender factor: Men are more likely to suffer from TIA or a stroke than women. If you have already had one or more TIA you are at a higher risk of suffering from one again. Sickle cell anemia; in such a diseases the red blood cells deform and are transformed into sickle shaped cells. Such cells have a very low oxygen carrying capacity and can easily get stuck in the arteries resulting in clots and hampering of blood flow to the organs. Races and ethnicity: According to studies and research it has been discovered that the Black people are at a higher risk of collapsing due to a stroke, mostly because of the high dominance of blood pressure and diabetes amongst their race. Here are certain risk factors that you can take charge and control of. The following factors do not imply that you will most certainly suffer from a stroke. These factors merely imply that you are at a greater risk of suffering from a stroke and amends must be made sooner than later. High Blood Pressure: there is a huge risk of stroke when the blood pressure begins to escalate, especially when it reached higher than 110/75 mm Hg. High Cholesterol levels: Consuming higher amounts of cholesterol and fat, most importantly saturated and trans fats will eventually increase the frequency of plaques in the arteries. Any cardio vascular disease like the heart failure, defect, infection or abnormal beating can all lead to TIA. If the blood vessels that supply blood to your brain, situated in the neck are clogged, it is known as the carotid artery disease and can cause high amount of dizziness. TIA can be a result of the clogging of blood vessels that supply blood to the arms and legs. With an escalation in atherosclerosis there is a rapid decrease in the size of the arteries due to the deposition of the fatty acids. Diabetes not only increases the amount of fatty acid deposits but can also increase the rate at which the fatty acids deposit in the arteries. An increased amount of amino acids in the blood can also lead to the thickening and scarring of arteries. This makes them vulnerable to clots. People with a mass index of 25 or greater are more susceptible to blood clots and feeling dizzy and nauseous. People who smoke cigarettes are at a higher risk of suffering from blood clots and high blood pressure. The components in cigarettes are known for accelerating the rate at which the deposition takes place in the blood vessels. Mostly, people who do not exercise daily or those who are inactive for huge portions of the day are always at a higher risk of developing clots. This is so because such people always have a large amount of fatty acid deposition in their arteries. Regular exercise is an excellent way to keep your body healthy and in shape. People who eat too much salt and excessive amount of fatty acids are always at a greater risk of suffering from TIA and a stroke. A healthier palette, containing proper proportions of food from every class is an excellent way to prevent your body from suffering from a TIA or a stroke. Heavy drinking is one of the most common risk factors that people are likely to suffer from. Men should not drink more than two glasses a day while women should not drink more than one glass a day. Drinking can also lead to dizziness due to high level of intoxication. Cocaine and other associated drugs are very common amongst young and middle aged people. They are classified as one the most common causes of strokes amongst young adults and middle aged people. Hormone therapy or birth control drugs are one of the leading causes of TIA and stroke. Hormonal changes cause an escalation in the rate of deposition of cholesterol or fat. Most of the time, a TIA is treated as an emergency case in the hospital. But a doctor’s appointment can be made for a thorough check up if you are concerned about suffering from a stroke or a TIA again. Be prepared to talk in great detail about your family history, about your health, your current life style and your previous life style with your doctor. Do not leave out any detail. Any bit of detail can be absolutely crucial in determining the current state of your health and the potential risk that it is in. Be prepared to be prodded and pierced by needles and injections, if your doctor prescribes a test for you, you must not hesitate in taking that test as the slightest of delays can have serious consequences. Before you take the tests though, ask you doctors for clear instructions about the requirements of the test. Some test, might require that you fast before the test is taken, others might require that you increase your fluids intake. Incorrect information regarding these requirements will only lead to inaccurate test results which will subsequently lead to increased health risks. It is strongly recommended that people who show the slightest sign of any of the above mentioned symptoms or are at risk from any of the above mentioned factors, they must make an appointment with their doctors immediately. Everybody must take into account all of the risk factors and analyze themthoroughly. Remember, prevention is always better than cure.